After more than a decade of “hurry up and wait” in the Cinema market, the analog-to-digital transition that most media started years ago is now achieving critical mass for movies. Yet today, many of the movies Americans watch at the local movie theater are still shown on 35mm movie projectors using the same technology that was in use when their grandparents were dating. Why the delay? For years, theater owners have been slow or reluctant to transition away from analog film projection to digital, because it was they who had to foot the cost of installing digital gear, while it was clearly the movie studios and distributors who would be the ones saving huge amounts of money on distribution costs– and WWII era laws prevented the two camps from cooperating to share costs and savings. Add to the mix Hollywood studio chiefs’ caution, as they observed the near-decimation of the recorded music business wrought by a swift transition to digital in that industry. The result: the digital conversion in the movie business has– until now– been neither a revolution nor much of an orderly evolution. Fast Forward to 2012, and the movie business is going through not an organized migration to digital but a sudden, major disruption unleashed by decades of built-up tension and antiquated business models. What’s changed? What opened the floodgates? And why such urgency now, after years of delay? With a flurry of activity this year, are we on track and hard at work to save one of the greatest art forms mankind has ever created, or are we seeing the magic of the silver screen slip slowly into something new and strange? It would be naïve to think that the cinema market would not transform as all media has in the face of the massive information technology, demographic, and political shifts taking place world-wide. In 2012, the kind of disruption to the Advertising industry, mobile phone, and Television industries, that has changed content platforms and content distribution business models forever, is now visiting the movie exhibition industry. Movie houses will survive, but we will soon see a very different movie landscape as commercial movie theaters– the ones who wish to survive the digital transition– will soon diversify away from just showing feature films and toward more content sharing with other media. And other, newer media platforms will now show Hollywood movies– first-run movies that will never show in a conventional movie theater. To date most of the creative community’s anxiety about the transition from analog to digital production of movies, and from analog to digital projection in commercial theaters has centered on purely technical issues. Would digital be– as promised– able to capture the “film look”? Would digital projectors finally achieve 4K resolution (4,000 lines of horizontal resolution), or beyond (similar resolution to the best big-budget analog movies)? We hang on every announcement of higher-resolution projectors, increased color space in the projected image. Most recently, there are breakthroughs in frame rate, perhaps pointing to that holy grail of today’s big studio chief: true 60fps 3D in 4K resolution– whether we need it or not. The bottom line this year: technical issues are no longer a roadblock to a full digital transition. We’re there. We have the technology, available now to any movie exhibitor. The major cinema projector makers– Christie, Barco, and NEC (those three being the only licensed Texas Instruments’ DLP Cinema technology providers), and Sony (using its proprietary SXRD technology based on LCoS), have the gear to not just provide an image “as good as film”, but better. The establishment of DCI specs– the Digital Cinema Initiatives, created by a consortium of the six major motion picture studios– together with the establishment of digital cinema Standards by SMPTE– have given the projector and server manufacturers, as well as theater operators and content distributors the ability to create a road map for conversion (with one caveat: 3D was not included in the DCI spec– hence the current frenzy in the industry over 3D content and exhibition). Rave Motion Pictures, the fifth largest chain of movie theaters in the United States, was a pioneer in the adoption of digital and 3D technology for feature movies. But the digital conversion does not stop there. Rave provides a Lobby Entertainment Network (LEN) air show display over concession areas, digital menu boards, LED way-finder signage, and extensive LED signage in its box offices. Increasingly, movie theaters will leverage both on-theater screen networks as well the inter-venue networks to provide and promote alternate content as well as Hollywood features. Indeed the transition to digital projection in movie theaters is powering ahead. In 2008 there were fewer than 6000 digital cinema screens. As of March 2012, in the U.S. more than 27,000 commercial movie houses had already moved to digital projection (with half of those deploying full 3D digital as well). About 12,000 have yet to convert. But the speed with which the analog holdouts are converting is fast. Each year, going forward, it will become more difficult for any exhibitor to cling to an all-analog theater. Now, it’s a matter of creating new business models that the digital transition will need to ensure nothing less than the survival of an industry. The agenda: preventing the kind of piracy that all digital formats facilitate; smoothing the transition away from cost distribution models associated with shipping platters of 35mm film and toward a new digital “Virtual Print Fee” (VPF) model that helps finance the digital conversion of theaters; and managing the timetable whereby movie studios and distributors will “officially” cut off analog distribution to the theaters. All of that is trickier than managing frame rates and color space on the screen. And it’s all complicated by the fact that the transition is not taking place in a vacuum but in a media landscape where theatrical movie attendance is under extreme pressure from scores of other media (more nimble than Hollywood or NATO) competing for consumers’ eyes and wallets. Understanding the Virtual Print Fee is one key to understanding the new movie distribution and exhibition business to which we are moving. Essentially, the VPF is a fee associated with the digital exhibition of a particular movie, paid by movie distributors (from Hollywood to Bollywood to small independent distributors) to theater operators, on a movie-by-movie basis. The VPF model is designed to help theater owners raise capital to defray costs of digital projectors, servers, and associated gear needed to replace 35mm projectors. The logic is straightforward: for years, theater owners were slow or reluctant to transition to digital, because it was they who had to foot the cost of installing digital gear, while it was clearly the movie studios and distributors who would be the ones saving money by not having to UPS and Fed-Ex all those 35mm film platters hither and yon (at an average cost of about $1200 per location). This dilemma set back the transition by decades. Depression-era antitrust laws surrounding the movie business in the U.S. set the stage for this standoff: the big Studios were forced by the government’s 1948 “Paramount Decree” to divest all their theater chains decades ago– hence the major players on both sides of the fence, NATO and Hollywood, were legally prevented from doing the obvious: merging or even cooperating, to institute efficiencies up and down the distribution chain. • 1927: The first feature film originally produced and presented as a “talkie”: The Jazz Singer, released in October 1927. 24 fps chosen as standard for shooting and projection. 24fps stabilized the audio to reduce "wow” and “flutter" type effects. Higher frame rates not chosen because the increased amount of film stock needed for a shoot, and film distribution, would raise costs. • 1948: The Paramount Decree, handed down by U.S. Supreme Court, rules that Hollywood movie studios must divest their ownership of commercial movie theaters, citing antitrust concerns. This legacy would hold back the conversion of movie theaters from analog to digital in the 1990’s- 2000’s. • 1927-2012: 24 fps remains the standard for commercial movie production, and exhibition. Projectors use “double flash”, or “triple flash” f– showing the same frame two or three times to boost the overall frame rate, to reduce much of the flicker audiences would otherwise see. • 2000: George Lucas announces that Episode II of the Star Wars Prequel Trilogy will be the first major motion picture to be shot 100% digitally. • 2002: George Lucas’ Attack of the Clones is the first motion picture to be shot completely on a high definition digital 24-frame system. Lucas’ vision of having audiences see the movie on digital projectors, not analog, is thwarted, in part, by the historic, legal, financing divide (resulting from the Paramount Decree) between Hollywood and the theater owners/operators. • 2002: Digital Cinema Initiatives (DCI) was formed in March 2002 as a joint project of major motion picture studios (Disney, Fox, MGM, Paramount, Sony Pictures Entertainment, Universal, and Warner Bros.) to establish and document specifications for an open architecture for digital cinema. • 2005: with the transition from analog film projectors to digital projectors in the cinemas well underway, 24 fps is chosen by DCI as the fps spec for 2D projection. • 2009: James Cameron’s Avatar is the first Hollywood blockbuster shot in 3D, at 24 fps. The film was originally scheduled to be released in May 2009 but was pushed back to December 2009, partly to give more time for theaters worldwide to install 3D-capable digital projectors. Avatar becomes the highest grossing movie in all of film history. • 2010: 3D accounted for $2.2 billion of the $10.56 billion domestic box office in 2010 – up 91% over 2009. - Movie director Peter Jackson of Lord of the Rings fame announces that The Hobbit: An Unexpected Journey, scheduled for commercial release in December 2012, will be shot at 4K resolution in 3D, at the HFR (High Frame Rate) of 48 fps. • 2012: in the U.S. more than 27,000 commercial movie houses have already moved to digital projection (with half of those deploying full 3D digital as well). About 12,000 have yet to convert to digital. - First public demos at cinema industry trade events of Hollywood movie footage, from films in production, that was shot in 3D at 48 frames per second/per eye (for total of 96 fps). - Flurry of industry activity as Hollywood studios and top Directors, digital cinema projector manufactures, and 3D enthusiasts, lobby for the quick adaption of HFR for 3D movie exhibition. - The SMPTE 21DC Study Group for Higher Frame Rates is tasked is with determining the actual compression bit rate required for quality higher frame rate stereoscopic movies going forward (for both cinematographers and the projection/exhibition community). • 2014: Analog film prints are expected to be largely unavailable to commercial movie theaters. Prior to the establishment of the VPF models just last year, a variety of byzantine cost sharing models designed to address this particularly American dilemma were tried and abandoned. But the timing was not right. Only with the recent convergence of higher DCI standards, new-gen projectors from the big four at lower prices, better encryption codecs to combat piracy, and perhaps most importantly the fire beneath of the seat of Hollywood execs’ pants that falling movie theater attendance have ignited– are all parties determined to match the business will and the technical way, in search of more viable movie business models. What has not changed is the U.S. government’s antitrust laws, applied in the best Fed fashion– a la carte according to what kind of lobbyists are involved. There are now– how many competing media outlets available to consumers in 2012 (as compared with about four in 1948)? But according to the Paramount Decree it’s still illegal for Columbia Pictures or Disney to own a movie theater. And so was born, in late 2011, the new Virtual Print Fee, for movie distribution. A couple of the top deployment entities in the U.S. are at the heart of this plan. Cinedign handles over 200 exhibitors in the U.S. DCIP was formed in February 2007 as a joint venture owned equally by movie theater chains AMC, Cinemark and Regal, and has executed long-term deployment agreements with Twentieth Century Fox, Sony Pictures Entertainment, Walt Disney Studios Motion Pictures, Paramount Pictures, Universal Pictures and Lionsgate Films. Of the top fifty exhibitors in the U.S., all but a handful have signed VPF agreements. But there are over 600 cinema owners in this country, many of which control small number of screens each. I asked Karagosian how these Virtual Print fees are going to affect distribution of movies. We all understand the logic of the Virtual Print fee in redistributing costs vs. expenditures in the digital transition. But certainly the Virtual Print Fee structure will affect the industry in ways that change what kinds of movies get distributed, to whom, how, for how much. How are the fees calculated, and divided up? Will a given big studio movie have a longer "shelf life" now in the theater, or less? What about indie movies? What about movie theaters/chains that took the initiative to convert to digital years ago? Will they get VPF funds allocated to them? The rules for determining the valuation of grandfathered equipment will vary somewhat among deployment entities. If the equipment was purchased several years before signing up, the valuation will be significantly less than that of new equipment, and possibly zero, according to players on both sides of the VPF equation. And what about smaller distributors, and distributors of more niche content– the indies? Traditionally, a small independent movie could leisurely make the rounds to theaters with even one 35mm print, thus recouping costs over a long period of time. Independent distributors who may think they can now distribute for low cost due to digital projectors, will learn that they have to pay a VPF just like the big distributors do. On the other hand, digital distribution allows every movie to be wide release– a decision that going forward will only be driven by the marketing budget not the physical distribution costs. But indie type of theaters are not under the new system getting much of a VPF, as the VPF emulates the cost of the film print, which for them, because the film print was shared, is only a small percentage of the full cost of that film print. BluRay? The VPF fee, as defined in most of the VPF contracts being written, is tied to the “digital cinema” projector. Why the quotation marks? Because in movie houses throughout the country there are three kinds of projectors: analog film projectors, “official” digital cinema projectors, and video projectors. What’s the difference between an official digital cinema projector and a regular video projector? A “Digital Cinema” projector is up to DCI spec, and was more than likely installed by a Deployment entity as part of a bonafide conversion of a theater to digital under DCI guidelines. But any theater can and often does have a non-DCI spec video projector in the booth–many of these were put in to show those (awful) Ads before the real Trailers and the feature movie start. Show content on the DCI-spec projector, and you’re under the watchful eye of Hollywood and/or the Deployment entity. Theoretically, if you show a movie from a BluRay not plugged into the DCI spec projector but a different video projector, you’re outside of VPF territory. Is all this set in stone? Not by a long shot– we’re in the wild west of the digital transition, and will be for a while (another example: the Ad content that runs before the Hollywood content at your local movie house- it’s outside of VPF territory too even though it will now transition to the DCI-spec projector– but at least one major Hollywood studio is lobbying to include it). So how both indie type of theaters and indie movie distributors will adjust to the digital transition is an important issue for anyone in the creative community. But it’s important to note that the VPF schemes are part of a transition plan, not a permanent one. According to Karagosian, a planned termination of the VPF period for a particular theater owner will depend on whether the cost of the equipment has been recouped, or if the agreed VPF period has completed. Karagosian expects the majority of VPF payments to end by 2020. VPF agreements with studios have a rollout period, and a VPF payment period– that’s understandable. But the rollout period for most if not all agreements is ostensibly ending this year. Once the rollout period closes, the program is closed to new participants. What does this mean for the market? It means that, today, there is a major flurry of activity that has reps from Sony, Barco, NEC, and Christie, huddling with NATO members, and Deployment entities, trying to fast-track the purchase of digital projection systems with some VPF contribution, while the hot money is around (and with Hollywood this year stoking the fire by dangling 48FPS 3D– that only plays on updated digital gear– in front of the market). Look very far at all down the road, and it’s a free market– sink or swim in a new media landscape where VPF’s will probably be the least of the movie exhibition industry’s worries, as a new generation of viewers watch content on smart phones, game consoles, wherever and whenever they please. So the race is on, and the pressure is on, this year, to convert virtually all the commercial movie theaters in the U.S. to digital. Fueling this, at the major industry trade shows this year, everyone is talking about new technical breakthroughs such as High Frame Rate, and Laser projection– and much of that is tied to 3D. Whether you love it or hate it, 3D is at the center of the Hollywood’s efforts to stem the defection of movie goers– to give people a reason to go to the movies for a different, unique experience, not watch content at home on their flat screens or on the fly with new personal digital devices (and 3D has the added benefit, for Hollywood, of being harder to pirate than 2D). 24 fps, looks to most of us like analog movies. 30 fps, we know from testing, looks to many like TV (the television industry has been using much higher frame rates of between 50 and 60 frames per second for decades). But 48 fps adds new data for the eye, and it produces a more seamless image. Phil Oatley, head of technology at Park Road Post, who are doing post on the new Hobbit production, said at the NAB show in April 2012 that shooting in 4K, 48 fps (on Red Epic cameras) as the crew of the Hobbit movie are doing, creates “ an avalanche of data”, generating 6-12 TB (that’s terabytes) of original shoot data from the cameras each day of the Hobbit shoot. After that April 24th HFR demo and taped address in Las Vegas by Jackson, a variety of bloggers and some industry press commented that the HFR images in the demo were not pleasing– too sharp, too detailed, too much like TV and less like film. Some of these observations even made it into the mainstream media who are always of course looking for controversy– real or created. But judging HFR based on a demo of basically raw footage from a movie that is not even edited yet– was a sideshow, and without much meaning to the consumer. Jackson was doing the industry a favor by showing this, to illustrate one narrow technical feature, in warts-and-all, non-color graded, unedited form, to focus on the HFR effect alone. He was not trying to create a finished product. You can be sure that when the studio releases a HFR trailer into movie theaters for the Hobbit, this summer, it will impress the most jaded– and the most nostalgic film lover. And HFR is not just about aesthetics– achieving new “effects”. It’s important to remember that many consumers– including a disproportionately large number of children– are actually physically unsettled by conventional, 24 fps 3D in theaters. They do not like it, and won’t watch 3D movies, period. 48 fps will help alleviate this problem, as the flicker and strob’ing will be minimized with the higher frame rate. But even as you make 3D with HFR a nice gift for the moviegoer– High Frame Rate has a variety of side effects, so to speak, for the industry. It needs lots of storage space. According to Phil Oatley, head of technology at Park Road Post, who are doing post on the new Hobbit production, shooting in 4K, 48 fps (on Red Epic cameras) as the crew of the Hobbit movie are doing, creates “ an avalanche of data”. Exaggerating? Oatley said at a panel at the NAB show in April that they are generating 6-12 TB (that’s terabytes) of original shoot data from the cameras each day of the Hobbit shoot. Also, there is so much detail and clarity in HFR, that more careful attention to make up, lighting, and really all elements of a production are needed. It’s harder to “suspend disbelief” of the viewer when every pore of an actor’s face stands out in digital clarity. And there are a variety of post production issues. Many units bought two years ago to do intermediates, do not have the bandwidth for HFR. And is SMPTE’s current JPG standard enough to support HFR? SMPTE is looking at this issue this year. Distribution of content? The same problem with so much data. In a 2007 study, the Academy of Motion Picture Arts and Sciences found the cost of storing 4K digital masters to be "enormously higher, 1100% higher, than the cost of storing film masters. Well, that in retrospect, is easy. Storing and distributing HFR content is going to add layers of cost into the equation– costs that VPF’s are not currently addressing. So will all the movie theaters in the U.S. now convert, or “upgrade” to High Frame Rate projectors? And in time for the December 14, 2012 release of The Hobbit: An Unexpected Journey? Depending on the particular manufacturers, and the age of the projector and other system components, cost estimates for this upgrade vary. Most installed Series 2 projectors from Barco, Christie, and NEC (the three DLP Cinema licensees) will likely need a software upgrade, and possibly a hardware conversion–as part of the equation involving conversion from a traditional, external (server-based) media block to an Integrated Media Block (IMB) to facilitate higher pixel rates associated with the more data-intensive HFR content. From left to right, Kathryn Cress (Marketing VP at Christie), director James Cameron , George Scheckel (Business Development Director at Christie) and Craig Sholder (VP, Entertainment Solutions at Christie) at an industry event in 2011. Christie is one of the major providers of digital cinema projectors and has worked with Cameron on a variety of HFR (high frame rate) and other cinema innovations. Cameron is planning on shooting the Avatar sequels in HFR– up to 60 fps. Between the Cinemark and Rave movie chains, there are nearly 4,000 screens in North America that have Barco Series 2 projectors with the required software update and a Doremi Integrated Media Block with beta software to make it capable of playing 48fps, Barco vice president of digital cinema entertainment, Patrick Lee said at the NAB show in April. These screens form part of the estimated 14,000 Series 2 projectors installed throughout North America. There are roughly 13,000 Sony 4K digital cinema projectors shipped worldwide to date, and according to Sony the company expects the majority of those screens to have high frame rate support– with a software upgrade only needed according to Sony– enabled by the time The Hobbit is released in December. Sony announced in April 2012 that this software upgrade will cost $3000 per unit. Sony projectors in the field already have an Integrated Media Block. Outboard media blocks– the most common configuration for content storage/distribution in a commercial movie theater until recently–are bandwidth constrained by the dual-link HD-SDI link between media block and projector. So the need for the Integrated Media Block, in this new HFR scenario, is important– but this transition to the Integrated Media Block configuration is well under way already, unrelated to HFR and 3D– IMB’s provide easy 4K resolution capability, HDMI inputs for a venue’s live events, added security benefits, as well as just old-fashioned cost efficiencies from integrating the media block into the projector (a move that could lead to “projector booth-free” movie theaters). However, a lot of the hand wringing in the press about the needed “software upgrades” to do HFR 3D on DLP Cinema projectors is overblown. TI’s DLP Cinema-based projectors receive a few software upgrades a year, every year, regardless of high frame rates. Upgrades include TI firmware upgrades released by TI to address bug fixes, improvements, or enhanced features, such as support for 3-D frame rates at or above 48 fps per eye. The uniqueness of the software upgrade of in the field projectors for HFR is overblown by most analysts. The technical issue related to 3D exhibition that is not being overblown but rather politely ignored by most industry observers is the perennial problem of 3D projection: it results in a lot less light getting to the screen, compared to standard 2D projection of any frame rate. Adding all those polarizing filters in front of projector lenses to separate the left and right eye images, and cutting even more light with the 3D glasses, eliminates so much of the projected image from the screen. This has always been and will continue to be as big or bigger a 3D deal-killer as frame rate issues. What is the industry doing about this? Enter the Laser projector. Replace that old-school Xenon projector lamp with a laser, and you get a quantum leap in lumens. Demos of this new laser projector technology (that can be grafted onto existing DLP projectors from Barco, Christie, NEC, or onto SXRD/LCoS projectors from Sony) are being done this year. It’s not ready for prime time yet, as standards for speckle level and measurement are not set, and economies of scale are not there, but it is this breakthrough– the ability to get the brightness of 3D movies on par with what consumers are used to seeing in movie theaters with standard movies– that will make or break 3D in the theater. But 3D, with HFR, and without, with the lamp houses we have today (not laser, but conventional Xenon lamp), is the major industry initiative this year, being well orchestrated at many levels, as Hollywood’s best shot to get more people in the theaters and away from their nice 1080P 60 inch flat panels at home. We’re used to hearing James Cameron pitch the glory of 3D. Peter Jackson, understood. Ang Lee’s first 3D film Life of Pi opens in December– curious. But when Martin Scorsese waxed eloquent at CinemaCon in Las Vegas in April (the annual movie theater owners’ convention), that had he had the technology available at the time he “…would have done all my films in 3D," it’s more than creative juices flowing. Hollywood is marshalling all its troops. 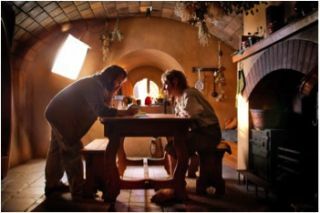 When the studio releases an HFR trailer for The Hobbit running at 48 FPS in theaters this summer– it will further fuel the frenzy. So is the digital transition in movie exhibition on track now? Are blue skies ahead? New technology rolling out. The movie theater experience revitalized, and ready for a new round of Block Busters. Isn’t this classic Hollywood, at its best? Time for a reality check. While technology and movie biz insiders discuss DCI-supported frame rate specifications, and watch private demos of new-generation laser-light engine DLP projectors, a new movie world is churning away beneath them. Step out of the ivory tower of DCI, and SMPTE, and put those brilliant engineers at Barco, Christie Digital, and Doremi, on hold, and go to a major Film Festival in this country. Entire generations of new film makers are being pushed into producing for web distribution–or best case scenario for the “big screen” of Video on Demand (VOD). At the SXSW Film Festival in March 2012, a spokesperson for one of the top five Film festivals in the U.S. said publicly “theatrical release is a money-loser, whose only purpose is to get VOD numbers up” (and trust me, she is one of the good guys.) I don’t know how many press releases I received during the SXSW Film festival, from one or another movie producer announcing a “major new distribution agreement” with Hulu, or some other strictly online platform. At SXSW Film, there was such high-level presence, on numerous panels, branded events, and exhibition spaces from the likes of Google and Vimeo and PreScreen (the latter started by one of the founders of Groupon), and so much (decidedly non–DCI) talk of the most important “film” trends as being Crowd-sourcing content, Crowd-funding, and moving all movie content permanently to the Cloud, that I left wondering if the commercial movie theater experience has a future, period. Or will it go the way of HiFi audio as the Apples and Googles and NetFlix of the world vie for market share and try to convince consumers that small, compressed, cloud-bound content is the way of the world and the inevitable conclusion of the cinematic evolution launched by the Lumière brothers more than a century ago. Surely this all sounds laughably alarmist to any young film maker, certainly to a film festival organizer, and to most movie fans. Obsession over technical platforms. Nostalgia for old media. The democratization of an art form (movie making) is held up by most creative people as a breakthrough. Being able to view content anywhere, anytime, is seen as practically an inalienable human right (not to mention a property right for many– regardless of whose property the content originally was or whether or not the original content producer is compensated). Exaggeration? Certainly the silver screen is not dying? In one of the more telling statements I heard from a major company at the SXSW Film festival, Jonathan Zepp, who directs Strategic Content Partnerships at Google/YouTube, sought to reassure the audience at one of the panels, that “for some people, film will always be a full screen experience.” Relieved? Actually, those people Zepp was referring to were consumers who watch a movie on a flat screen television in their living room, as opposed to a tiny Youtube frame on their laptop or smartphone! Full screen indeed. Yes, Google/YouTube and Hulu and Netflix will transform a variety of industries, but hasn’t Hollywood been telling us that the movies are still doing great? “Over the past five years, North American box office revenues are up six percent. Last year’s total worldwide revenue of $32.6 billion represented yet another record high,” said former U.S. Senator, now chairman and CEO of the Motion Picture Association of America (MPAA) Christopher Dodd, at the CinemaCon conference in April. But revenues up only 6% in five years, is not that great– and it worries many that movie attendance is down in the U.S. over the same period (revenue is up barely, because ticket prices have been raised to make up the difference). Showing content in a different way, to woo more people into the movie theaters, is what 3D and HFR is all about. But the industry also wants to show different content, in the same old way, to get more bottoms in seats. Remember Cinedign? The major movie U.S. distributor that’s now involved in the effort to use Virtual Print Fee funds to help complete the digital transition in movie theaters. At a major presentation entitled “A Change is Going to Come” at the Technology Summit on Cinema, on the eve of the NAB show in March, Chris McGurk, CEO of Cinedign, outlined what he saw as the future of cinema. Pointing out that only 5 % of seats are occupied in theaters Monday-Friday (15% on a yearly basis), and given big studios’ focus on blockbuster movies (making fewer movies each year and putting all their eggs in the blockbuster basket), McGurk stressed that we have to find new content to fill those seats– live sports, music, interactive, more indie movies in local theaters. A more “ targeted, narrowcast” market, said MCGurk. “Digital cinema can be more ‘rifle’ approach not shotgun approach. Digital allows us to target the marketing. While enhancing exposure as only a theatrical release can do.” McGurk added that this new kind of content can use social media to draw people in. And that there are myriad ad revenue possibilities. “Narrowcasting in the theater is the new call to arms,” said McGurk. With only 5% of seats occupied in theaters Monday-Friday and given big studios’ focus on blockbuster movies, Chris McGurk of Cinedign says the industry needs new content to fill those seats– live sports content, performance streaming, interactive events, more indie movies. Narrowcasting? More ads in movie theaters? Are we still talking about saving cinema? Or morphing it into something that today’s Hollywood studio chiefs, and today’s cinema buffs, would not recognize? The movie industry can only be understood in the context of the larger media disruptions that are taking place in markets whose size dwarf Hollywood. The smartphone market alone is already hugely disrupting several industries, including the computer business, television broadcast, digital signage (ads and information on public displays), and now movies (you can now download major Hollywood movies directly to your iPhone or iPad). Shifting content delivery models are sweeping over all media consumption. That the movie industry– what many thought the last bastion of old-school, tightly controlled and nurtured content– is undergoing massive changes in business models is but part of a story of seismic changes in the global economy spawned by the new technology tools that are readily available to everyone on both the supply and demand side of the distribution equation. So while the skeptical and the cautious may see 3D, or High Frame Rate, or alternative content in movie theaters, as unsettling, expensive, or complex transitions with unproven rate of return or questionable motives, none of what is happening in 2012– a year that’s seeing the most sweeping changes in cinema since the birth of the Talkies– would surprise Cecil B. DeMille, who screened the first full length feature film, a century ago, at Jacob Stern’s horse barn at the corner of Hollywood and Vine in Los Angeles, or the Lumière Brothers, who gleefully disrupted the seemingly entrenched movie standards of the formidable Edison machine at the turn of the 20th century, when no one could have predicted that both the magic and the business of the movies would thrive as they did in the next hundred years– or that they would survive so many assaults from so many fronts in a wild century of media upheaval that shows no sign of settling down in cinema’s second century.